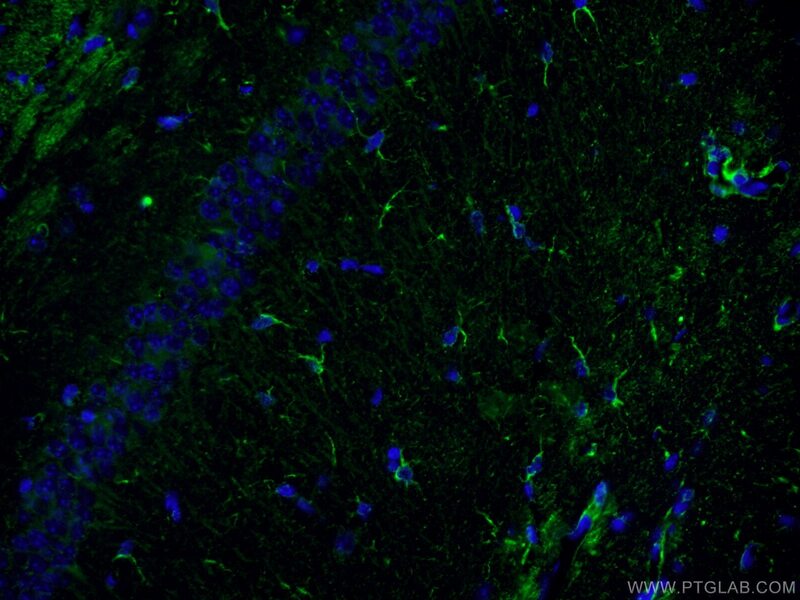 Immunohistochemical analysis of paraffin-embedded mouse brain tissue slide using 60189-1-Ig (NF-L antibody) at dilution of 1:200 (under 40x lens) heat mediated antigen retrieved with Tris-EDTA buffer(pH9). 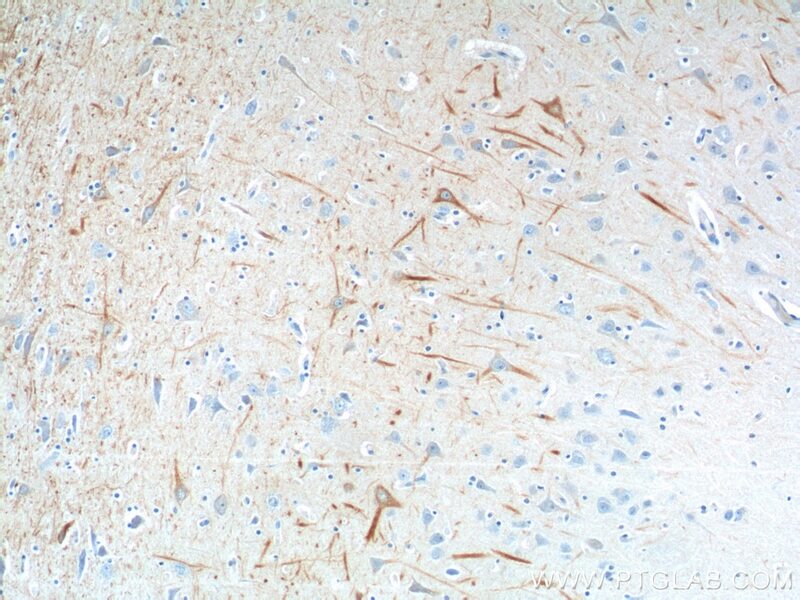 Immunohistochemical analysis of paraffin-embedded human brain tissue slide using 60189-1-Ig( NF-L antibody at dilution of 1:200 (under 40x lens). 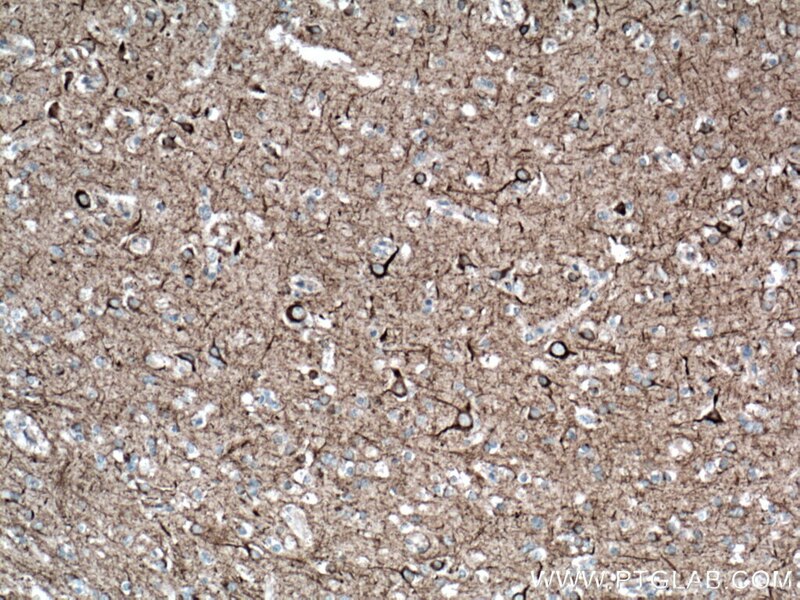 Immunohistochemical analysis of paraffin-embedded human brain tissue slide using 60189-1-Ig( NF-L antibody at dilution of 1:200 (under 10x lens). NEFL, also named as NF68 and NF-L, belongs to the intermediate filament family. Neurofilaments are the 10 nm intermediate filaments found specifically in neurons. They are a major component of the cell's cytoskeleton, and provide support for normal axonal radial growth. 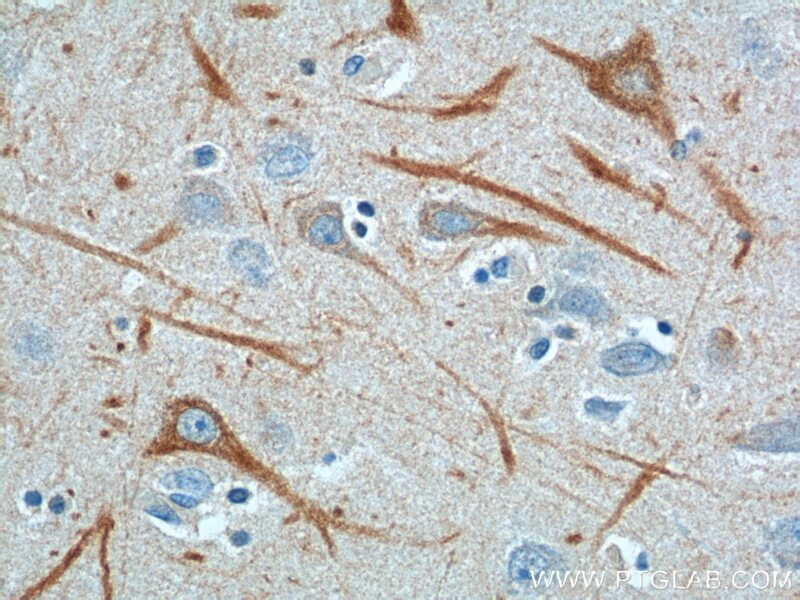 Neurofilaments usually contain three intermediate filament proteins: L, M, and H, which are involved in the maintenance of neuronal caliber. 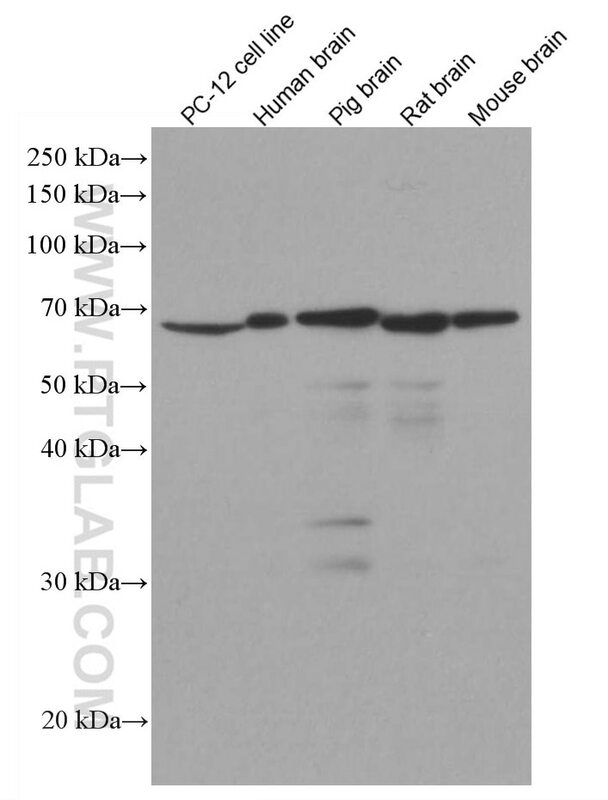 The names given to the three major neurofilament subunits are based upon the apparent molecular weight of the mammalian subunits on SDS-PAGE: NF-L, 65-68 kDa; NF-M,145-160 kDa and NF-H, 200-220 kDa.This antibody is specific to NEFL. 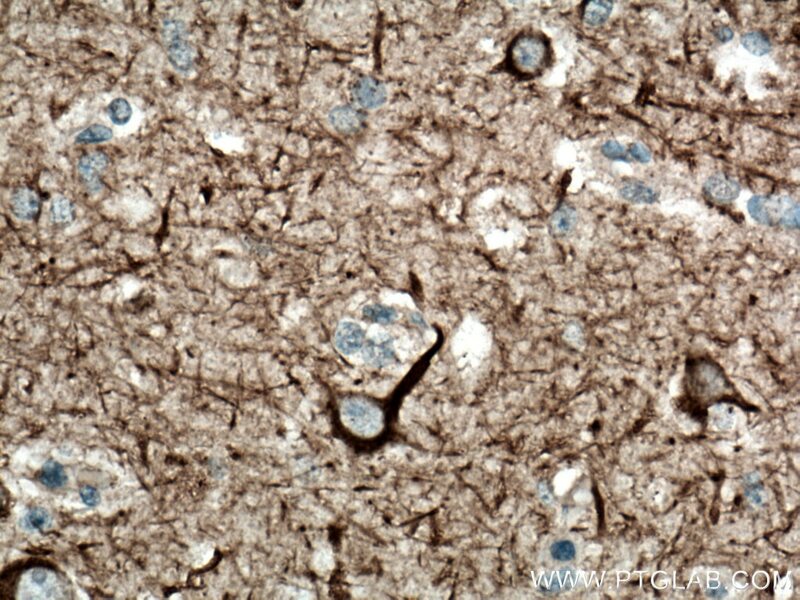 Immunohistochemical analysis of paraffin-embedded human brain tissue slide using 60189-1-Ig (NF-L antibody) at dilution of 1:400 (under 10x lens) heat mediated antigen retrieved with Tris-EDTA buffer(pH9). 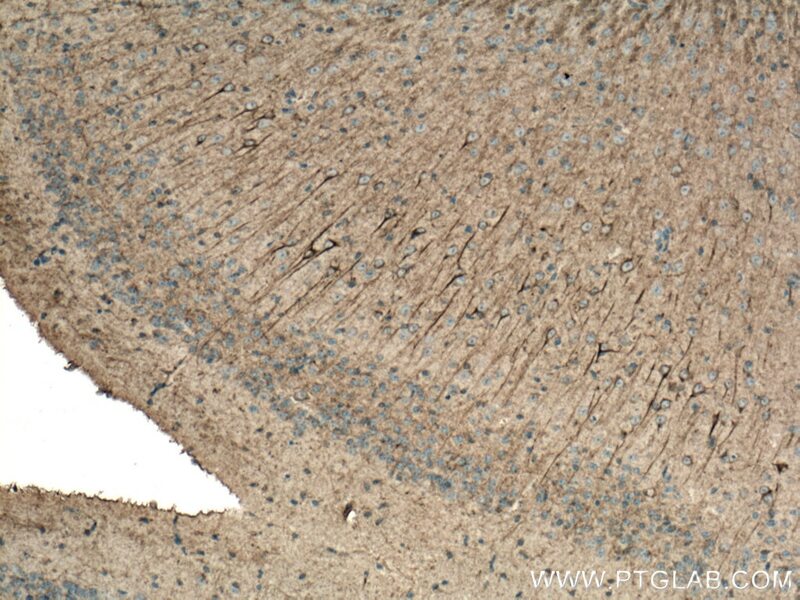 Immunohistochemical analysis of paraffin-embedded human brain tissue slide using 60189-1-Ig (NF-L antibody) at dilution of 1:400 (under 40x lens) heat mediated antigen retrieved with Tris-EDTA buffer(pH9). 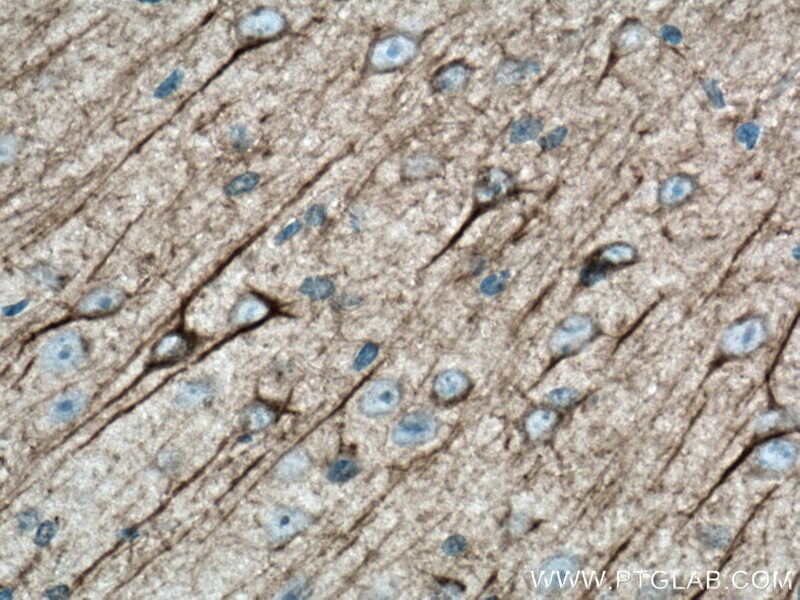 Immunohistochemical analysis of paraffin-embedded mouse brain tissue slide using 60189-1-Ig (NF-L antibody) at dilution of 1:200 (under 0x lens) heat mediated antigen retrieved with Tris-EDTA buffer(pH9). 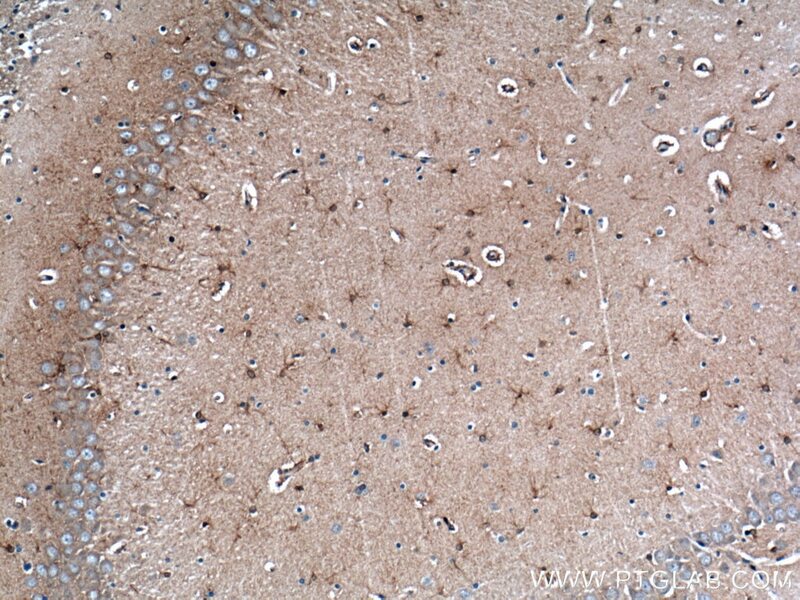 Immunohistochemical analysis of paraffin-embedded rat brain tissue slide using 60189-1-Ig (NF-L antibody) at dilution of 1:400 (under 10x lens).